Teaching two-legged robots a stable, robust "human" way of walking – this is the goal of the international research project "KoroiBot" with scientists from seven institutions from Germany, France, Israel, Italy and the Netherlands. 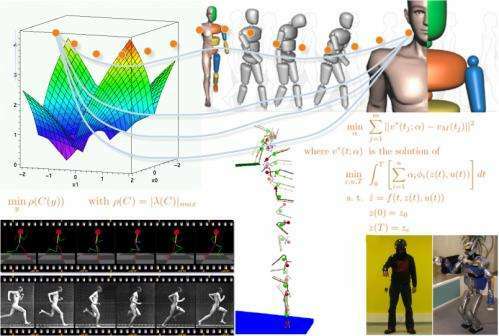 The experts from the areas of robotics, mathematics and cognitive sciences want to study human locomotion as exactly as possible and transfer this onto technical equipment with the assistance of new mathematical processes and algorithms. The European Union is financing the three-year research project that started in October 2013 with approx. EUR 4.16 million. The scientific coordinator is Prof. Dr. Katja Mombaur from Heidelberg University. Whether as rescuers in disaster areas, household helps or as "colleagues" in modern work environments: there are numerous possible areas of deployment for humanoid robots in the future. "One of the major challenges on the way is to enable robots to move on two legs in different situations, without an accident – in spite of unknown terrain and also with possible disturbances," explains Prof. Mombaur, who heads the working group "Optimisation in Robotics and Biomechanics" at Heidelberg University's Interdisciplinary Center for Scientific Computing (IWR). In the KoroiBot project the researchers will study the way humans walk e.g. on stairs and slopes, on soft and slippery ground or over beams and seesaws, and create mathematical models. Besides developing new optimisation and learning processes for walking on two legs, they aim to implement this in practice with existing robots. In addition, the research results are to flow into planning new design principles for the next generation of robots. Besides Prof. Mombaur's group, the working group "Simulation and Optimisation" is also involved in the project at the IWR. The Heidelberg scientists will investigate the way movement of humans and robots can be turned into mathematical models. Furthermore, the teams want to create optimised walking movements for different demands and develop new model-based control algorithms. Just under EUR 900,000 of the European Union funding is being channelled to Heidelberg. Partners in the international consortium are, besides Heidelberg University, leading institutions in the field of robotics. These include the Karlsruhe Institute of Technology (KIT), the Centre National de la Recherche Scientifique (CNRS) with three laboratories, the Istituto Italiano di Tecnologia (IIT) and the Delft University of Technology in the Netherlands. Experts from the University of Tübingen and the Weizmann Institute of Science in Israel will contribute from the angle of cognitive sciences. Besides the targeted use of robotics, the scientists expect possible applications in medicine, e.g. for controlling intelligent artificial limbs. They see further areas of application in designing and regulating exoskeletons as well as in computer animation and in game design. Can soft robots transform health care, gaming, and other fields?